Welcome to the Best Boot & Leather Waterproofing on Earth! 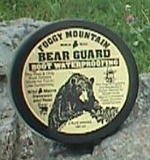 Foggy Mountain BearGuard Boot Waterproofing & Leather Waterproofing order page. Please look to the left of your screen and explore some of our other product lines. Thanks! Buy 3 and SAVE! The World's Best Boot Waterproofing. Made from an original trappers recipe of Maine Beeswax and Real Bear Fat. Whether you are looking for boot waterproofing, shoe waterproofing or leather waterproofing and leather conditoning. BearGuard is the world's best.